Size: Ray is 13" long, frame is 16.5" X 19.0"
This is a spectacular display fossil. It is a beautiful, museum quality Stingray specimen from Lincoln County, Wyoming. 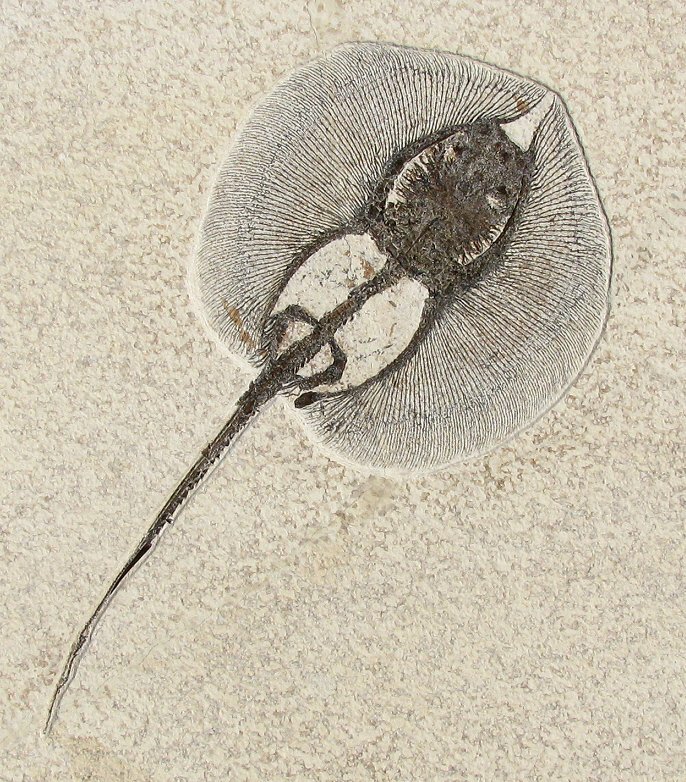 This is a female Heliobatis radians, one of the most sought-after fossils found in the Green River Formation. The Ray has great natural color, which contrasts beautifully with the buff-colored matrix. The fossil has excellent detail - the backbone, the barbs along the tail, the mating graspers (only on males!) and the long ''stingers'' are all intact and well preserved! This fabulous specimen is well centered on the rectangular matrix plate. The large plate has been professionally framed for optimal display. And at a full inches long, this Stingray is quite an impressive fossil. This is a breathtaking example of a rare Stingray fossil that can not only be part of a fossil collection, but also proudly displayed in your home or office.